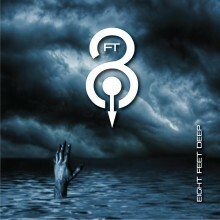 Eight Feet Deep is a rock project conceived and composed by Long Island, NY guitarist Billy 'Pills' Fridrich. Fridrich employs local Long Island musicians to help him achieve his rock vision for Eight Feet Deep. Among those that have performed on his songs are Bobby Rondinelli of Black Sabbath/Rainbow and Mike DiMeo of Riot. Fridrich has recently begun recording with Mickey James at his Freedom of Speech studios - Mickey is the songwriter and engineer for Criss Angel. In addition to playing lead, rhythm and bass guitars, Fridrich often programs drum sequences to enhance the overall sound of Eight Feet Deep's music. This CD will be a joy for guitar enthusiasts out there who enjoy technically savvy guitar showmanship, & shredding solos via a classic 80’s rock delivery.